The week before the Pope arrived in town, my friend Dana told me she thought the visit might be like the World Series parade. The city was warning us of street closures, days off from work or school, millions flocking to our streets. Sure, I don’t observe (let alone celebrate) Catholicism, but I couldn’t deny the potential magic of our city filled with happy people. Unlike many of my fellow Philly residents, this idea excited me and didn’t make me flee to the shore or a campsite out of town. 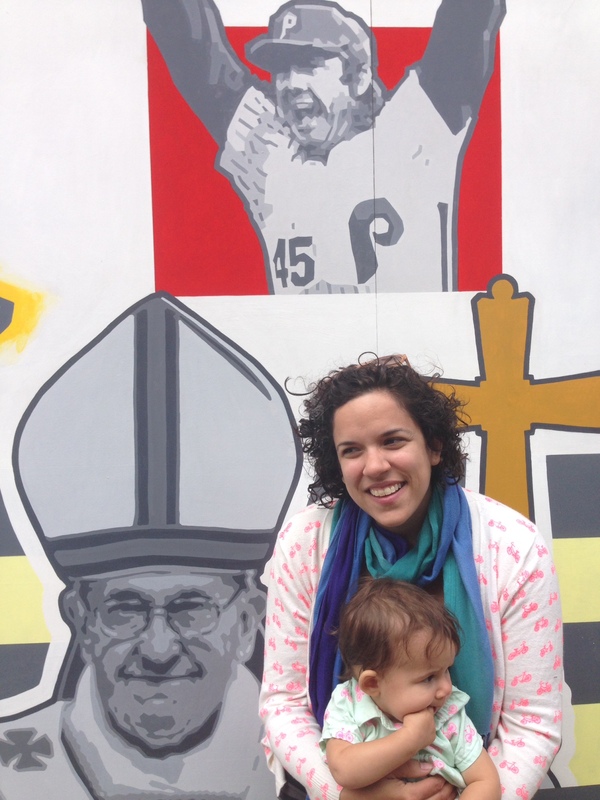 Me and my daughter with Tug and the Pope. Given that 2008 is much longer ago than we care to admit, I’d say our city was in need of come celebration and some national attention. We’re by nature negative self-haters, but turning the spotlight our way can’t help but feel justifying that we live somewhere legitimate. And having the spotlight because a figure of international influence chose us sure beats the spotlight because of say, our pathetic, ongoing school funding crisis. So like that magical fall seven years ago, we could set aside which church or sports team we worship, and all get behind being a happy city together. Well, man oh man, did that weekend give me that same blissful glee as seeing our players waving atop flatbed trucks. Less than seeing the Pope on stages in front of our historical and cultural landmarks, the simple fact of quiet car-free streets is what I’d argue changed the tone. We took our daughter on a bike ride with other bike-riding families, and we passed along the way thousands of bikers taking the streets as their own. For once, these cyclists found themselves at the top of the transportation food chain with no need for the bristling arrogance of self-preservation our tiny streets impose upon us when filled with motor vehicles. Fellow parents positioned their kids in a variety of contraptions to move through the streets at a leisurely pace, and as I found myself in the middle of the pack — bikes as far as I could see in front of and behind me — I felt like I was sitting in Citizens Bank Park singing High Hopes with Harry that one last time. I couldn’t wipe that grin off my face for hours. And it continued beyond that single ride. As if we were all wearing our Phillies gear as our new personal uniforms for the days preceding and following a post-season run, we had this tacit camaraderie on our journeys through the the empty streets. Our joy made us spin donuts in the center of Broad Street, made us smile at every National Guardsman, made us ignore the chill in the air as Fall presented itself. We’ve stood in the freezing rain to watch Brad Lidge throw strikes, we wouldn’t let a little wind keep us inside, missing out on the chance to really interact with the city the way it was built to be enjoyed. One friend and I talked about how maybe this weekend was showing us what Philadelphia was like for our founding fathers. They built the streets in consideration of walking or riding a horse. Never could they have imagined streets full of cars. In fact, the Philadelphia Phillies made their first appearance nearly a decade before the first car drove here. So shouldn’t this sense of enjoying a leisurely game take precedence over hurriedly honking at someone just enjoying their day? In other words, Baseball was part of our culture before cars. And while we think of vehicles as a sort of birthright and given for living here, it’s barely been 100 years — or less than half our city’s life. I’d like to think that anyone who loves the city the way I do — loves the block parties, the parades, the feeling of victory that forces you onto the street to high-five your neighbors — would love this city without their car. Just as much. More. Even if you found yourself a transplant in a city with a team you didn’t love, you’d understand when your neighbors who love that team, who have waited for that team’s moment, wanted to celebrate. You wouldn’t stand and boo them in their home town. I’m not being subtle comparing car owners to Mets fans here, but what I’m saying is – you’ve got to understand that we live here too. We, the parents, the pedestrians, the cyclists. We deserve our small victories and our wins and our days of closed streets. For better or worse, looks like the next day of closed streets will come our way well before we see another parade down Broad Street.